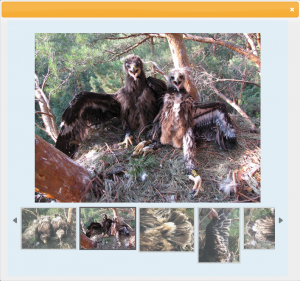 NextGIS has developed information system for input, processing and visualization data of raptor banding for Russian Raptor Research and Conservation Network (http://rrrcn.ru) . System is fully operational at Network site. Developed system represents Web interface for database on banding and returns. Currently this database contains 752 records. Each record consists of multiple attribute fields such as species of birds, date, coordinates, number, abbr, color and material of a band. Also each report contains information about reporter. Presented data is opened (except for precise coordinates as they are sensitive for poaching reasons). The list of reports is presented at the “Reports” section. To get detailed information one should click on chosen report (e.g. http://demo.nextgis.ru/birdreport/report/871). Each researcher who wants to share information about bands he put on can add corresponding report to database through the Web interface (including photos) using special form. 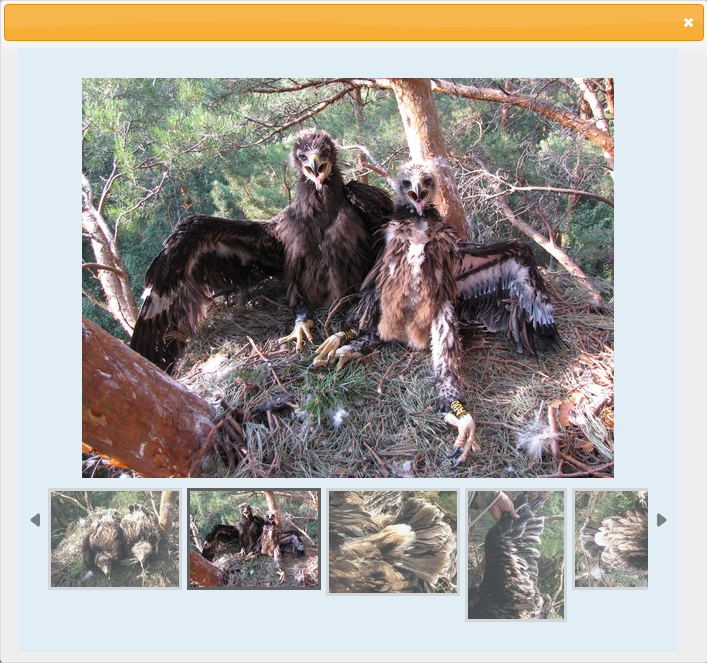 Each viewer who made photo of banded bird or found a band can also post information to database. Each new record is automatically marked as “Not confirmed” and displayed in yellow waiting for editors to confirm it. Besides Web interface for input and output of attribute data mapping system is also available. This system is located at “Map” section. 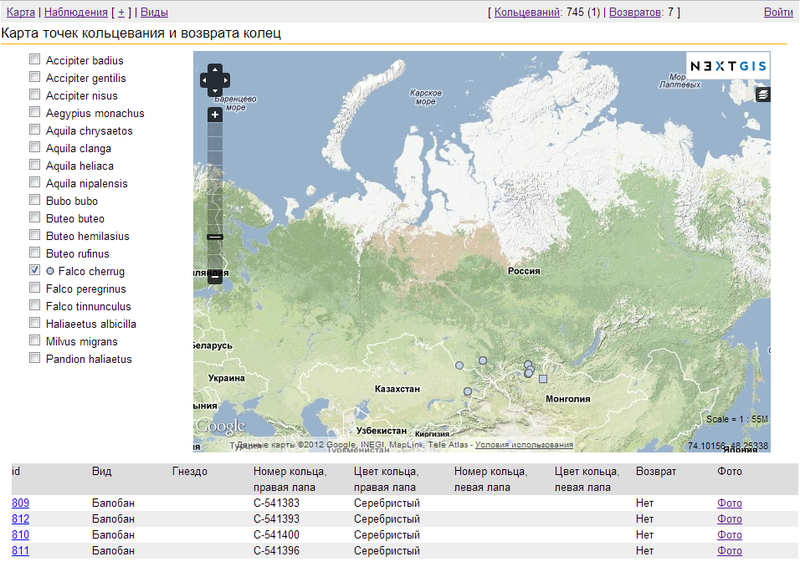 For displaying data on the map switch on species in list which is located in left side of map. Banding places are indicated as circles, returns as squares. When one clicks on one of the point – table with brief information about reports located within click tolerance is shown below the map. To see full information you should click on record id. To see photo – click on “Photo” link if one is present. When point on the map is clicked the system tries to find records with the same band color and number combination. If such records exist – corresponding points are connected with the line appoximately showing the travel distance. In order to prevent the disclosure of information about the exact coordinates of observation points are not displayed on the map starting from scale 1: 400 000. The system is built using exclusively open source software: PostgreSQL, MapServer, OpenLayers and runs on any modern web browser and doesn’t require any additional software.